I was finally able to get some work done on the Kodiak this weekend. The snow drift in front of the trailer door has melted. It was still pretty cold but at least I was able to get inside to make sure everything was OK and do some easy outside projects. Those Christmas gifts Georgia bought for me are finally getting installed. 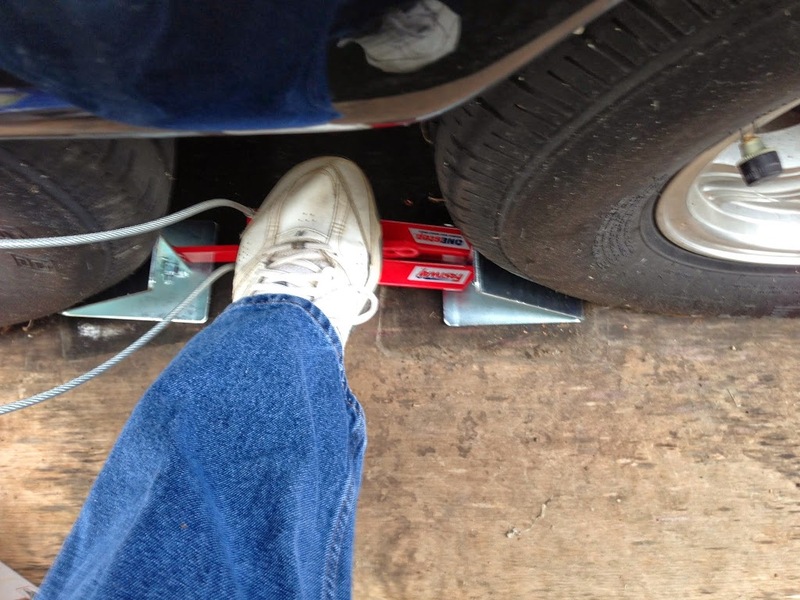 A step-on wheel chock only required five minutes to adjust the length and it is ready to use. Now I can just drop it down between the wheels, line it up with my toe and step on the top to lock it in place. The cable is still enough to just lean against the tire where it is easy to grab, Pull up and the chock is free. No bending or kneeling and it doesn’t slip out. Another five minutes and I also had a new battery fill system installed. 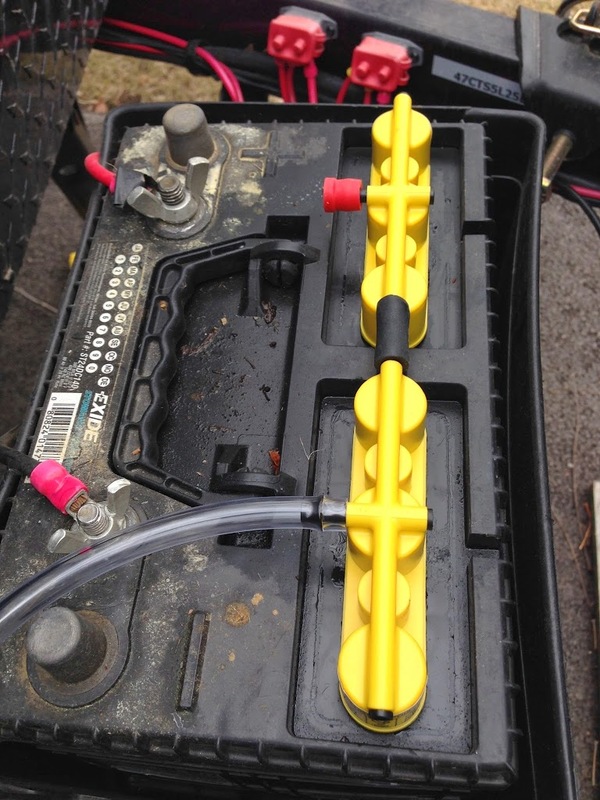 The kit comes with tubing that is marked with cut lines for different battery groups. I cut off the group 24 piece, joined the two manifold sections together with it and the whole thing fit into place perfectly. I found out that the system was not complete though. The squeeze bulb that you use to pump distilled water from the bottle is not included it the kit. I had to make a run to the local Camping World to get it. Now I can just hook up the bulb and squeeze until it is firm – each cell is filled to exactly the right level. I always struggled with getting the trailer breakaway cable positioned just right. It was either dragging on the ground or wrapped around the electrical cable or chains. This coiled cable is just what I need to keep it neat and stop the dragging. I just cut off the old cable and clipped on the new one – two minutes to solve a nagging problem. One other gizmo that I wanted didn’t require any installation yet. The Trailer Beacon Light servers two main functions. 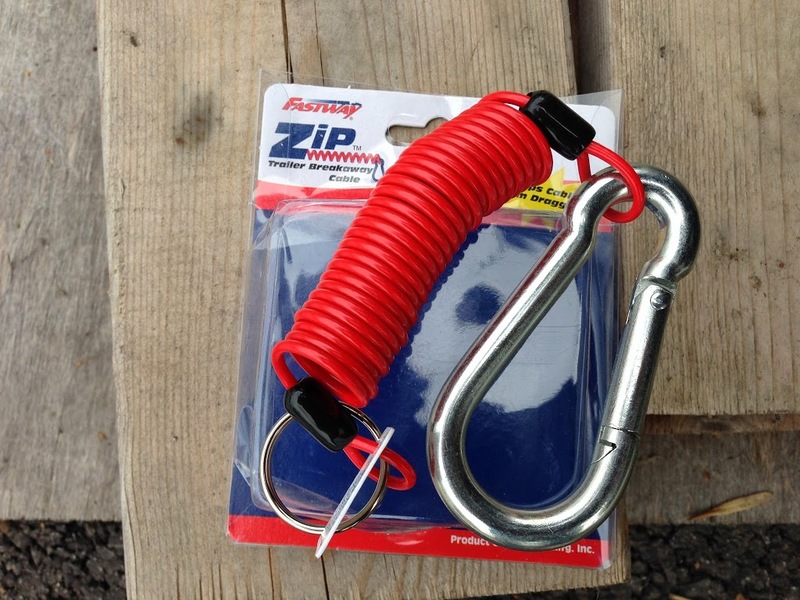 First, it protects your coupler plug when not attached to the tow vehicle. 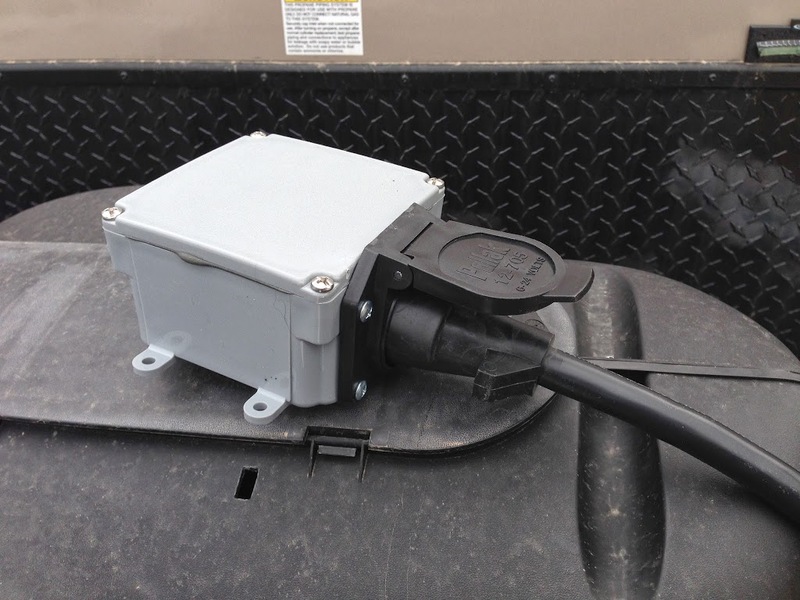 Second, flip a toggle switch on the side and the trailer marker lights will turn on – again with no connection to the tow vehicle. The box can be mounted on the trailer frame, and I might do that some day, or you can just leave it free standing. The lights make your trailer easy to spot if you are coming back to it or if friends are trying to find you in the campground. I also realized that it is a good way to check your lights even before you hook up. I have a couple more complicated installations coming up so stay tuned for more preseason modifications.